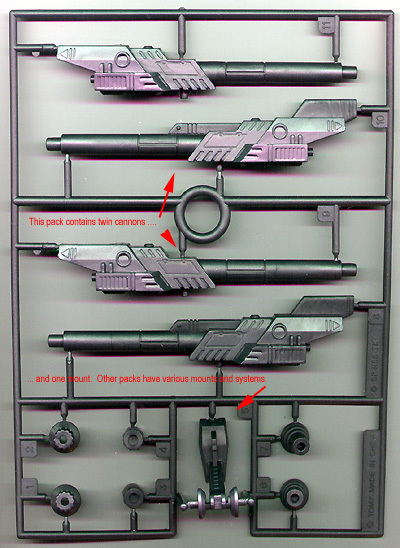 Kit preview of Zoids Accessory Parts. Overall Rating: 9 - great for all sorts of sci-fi kit-bashing and scratchbuild projects. "Zoids" are Tomy's series of mecha/robots shaped like various animals and insects. All are snap-together, and all are mechanized/motorized - eyes may light, the creatures walk or crawl, etc. ^ This BFG was made using a Zoid "CP-07 Cannory Unit", the gatling from some Gundam, and the lower half of the PPC used by a Battletech "Griffon". The line has a devoted following of addicts as passionate as any Trek modeler. Along with the regular creatures, Tomy have released or reissued a series of accessories - guns and boosters mostly, to customize your critters. These accessories are as cool as Wave's line of sci-fi extras, and quite affordable. Each accessory pack comes on one largish (5" x 7", about) sprue, with a sheet of instructions inside, and color photos on the back of the card depicting critters you can add them to. The plastic is hard, but sands easily. The parts are designed to snap together, and fit is quite good. You can glue the parts together, but you'll need to use superglue - regular plastic cements - even Tenax and Ambroid - bounce right off. These accessories are great for kit bashing projects - and not just of mecha and robots. There are several booster and weapon sets that are ideal for tricking out your space fighters, for instance. And at $5 or less (before shipping), they're quite a steal. 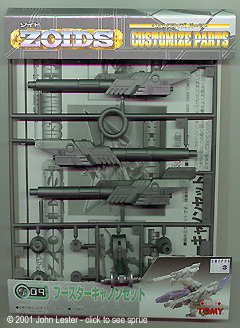 I haven't found a source in the US for these yet, but HLJ and Rainbow 10 have, or can get, them in stock. Get together with your buddies and put in a big order, to spread shipping costs around. This page copyright © 2001 Starship Modeler. Last updated on 25 May 2001.